은 조선 중기의 문신이자 시조작가인 농암 이현보(1467∼1555)의 초상화이다. 이현보는 연산군 4년(1498)에 문과에 급제하여 여러 직책을 거친 후 말년에는 후진양성에 힘썼다. 그의 많은 저서 중에서『어부가』등의 시조가 특히 유명하다. 이 그림은 가로 105㎝, 세로 126㎝로 비단에 채색하여 그렸다. 위가 뾰족한 패랭이를 쓰고 붉은색이 감도는 옷을 입은 모습으로 허리에는 물소뼈로 만든 각대를 두르고 있으며 오른쪽을 바라보며 책상 앞에 앉아 있다. 조선시대 초상화는 손이 나타나지 않는데 비해 한 손에는 지휘봉 모양의 불자를, 다른 한 손은 책상을 잡고 있다. 책상 아래로는 검은 가죽신이 보인다. 이 그림은 선생이 관찰사로 있던 중종 32년(1537)에 동화사의 승려이자 화가인 옥준이 그렸다고 전해진다. 그 후 순조 27년(1827)에 훼손을 우려한 후손들에 의해 이 그림의 모사본이 만들어졌다. 특이한 모습을 하고 있지만 얼굴과 옷주름을 단조로운 선으로 표현하는 옛 기법을 볼 수 있는 작품으로 현재 몇 점 남지 않은 16세기의 초상화로 그 가치가 매우 큰 작품이다. This is the Portrait of Yi Hyeon-bo (1467-1555, pen-name: Nongam), a civil official and sijo (Korean traditional three-line poem) writer of the mid-Joseon Period. This portrait, drawn on silk, is 105 centimeters wide and 126 centimeters long. Yi Hyeon-bo passed the civil service examination in 1498 (fourth year of King Yeonsangun’s reign) and served in diverse government posts until he retired and went to his hometown to train the younger generation. He wrote many books, but his poem Eobuga (Song of Fisherman) is particularly famous. In the portrait, he wears a pointed bamboo hat as well as red clothing and belt made with the bone of a water buffalo. He is looking at the right side and sitting in front of a desk. Portraits of this age usually do not show the person’s hands, but Yi Hyeon-bo in this painting is holding a monk’s fly swatter in one hand and gripping the desk in the other. His black leather shoes are also shown under the desk. 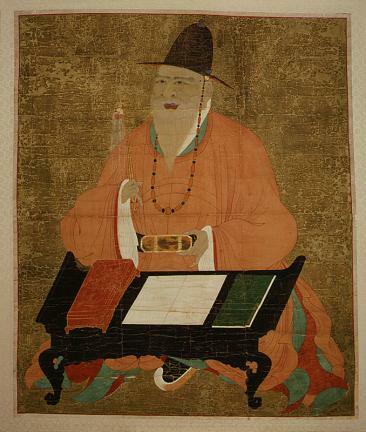 This portrait is presumed to have been painted by Okjun, a famous monk painter of Donghwasa Temple, in 1537 (32nd year of King Jungjong’s reign) when Yi was a provincial governor. Later, his descendant made a copy of this original out of fear of damage in 1827 (27th year of King Sunjo’s reign). It shows a unique figure of him and the old style of painting that touches the face and clothes’ folds with simple line. It is considered to be highly valuable, since few portraits of the 16th century remain today.